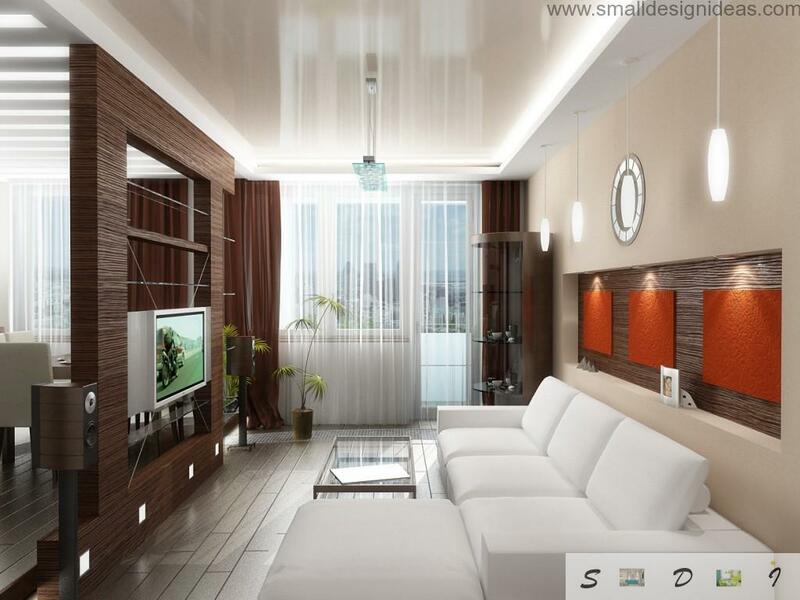 Current trends in the design of the living room are influenced by changes in its functional role. Earlier in the room people have watched television and had dinner, took a large companies of guests, danced, celebrated the solemn dates. Now it is considered to be more convenient to arrange collective festivities outside the home – in a cafe or restaurant. The living area becomes more closed to prying eyes and casual visitors. Today’s living room is a place of personal or family time, so it is more comfortable and appropriate to the needs and true tastes of its inhabitants, and not “exhibition” showpiece to confirm the status of the hosts. In small spaces with the right approach can be beautifully combined living and dining room, and even the nook office. The design style is not playing a large role in the sense that you can choose the one which you had dreamed of for a long time, and which is associated with your personal understanding of an ideal interior. The main thing is to create a pure space as a result, which will give a sense of spaciousness. Small living room is not a reason for sad thoughts that for realization of interesting solutions and design fantasies is not enough available square meters. Quite the contrary. There are techniques that can visually expand the space. As if by magic, you can change the room without changing its actual size. If you have a small living room, try a few visual tricks to make seemed space more voluminous, more illuminated, higher. You can make it. It seems magic, but in fact it is science. At the end of the XIX century German scientist Hermann Ebbinghaus (1850-1909) explained how to achieve the change in the perception of the size of the object using the theory of Titchener circles. The essence of the observation that in one and the same circle figure appears to be larger, if it is surrounded by smaller circles, and less when the circles are much larger. Why is this happening? We perceive the size scaling on the elements that surround us (relative size). 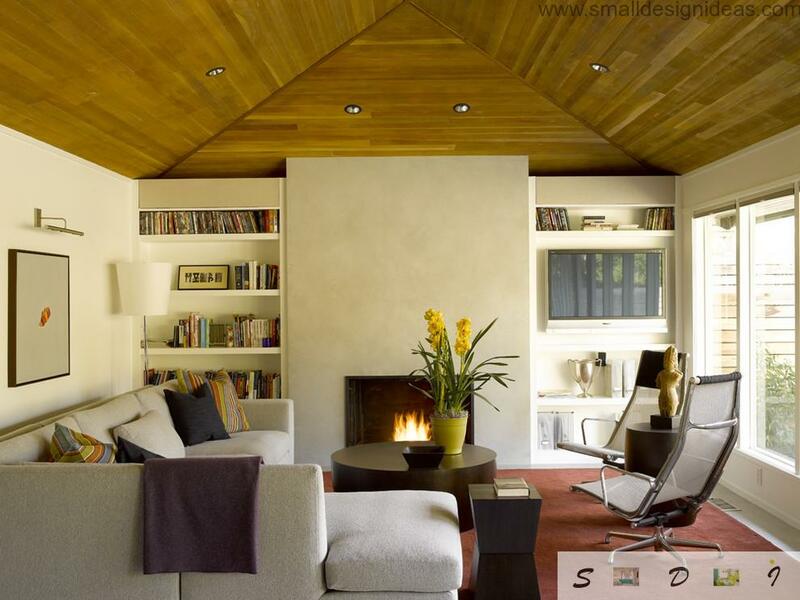 Therefore, to increase a small space visually, decorate it with small sized furniture. In addition, please note that without any optical focus room, although equipped with comfortable seats, is poorly balanced. 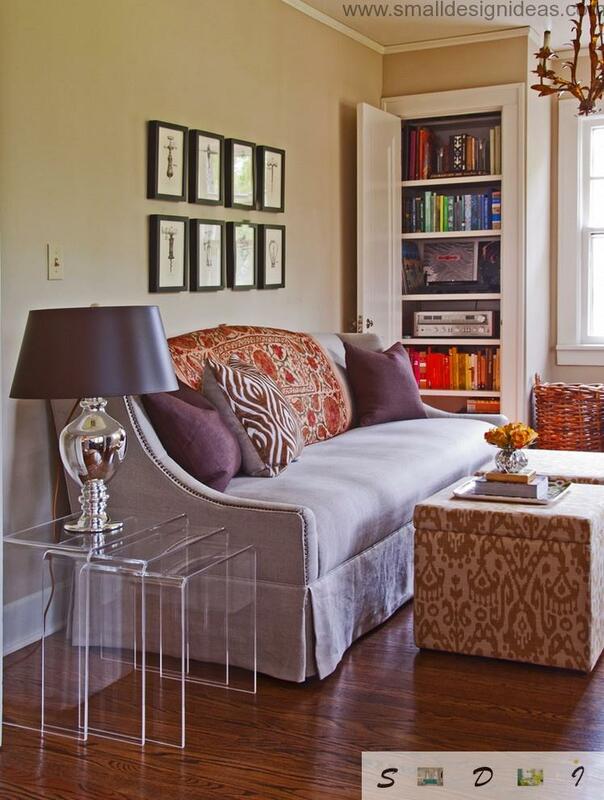 You can turn the sofa into the focus of the living room, encircle it with small-sized seats. The living room will appear larger and much nicer to look at. Color is one of the main tools for visual extension of the space and providing light all over the room. The problem of excess applies to color and texture, which glut will negatively affect the perception of a clean and organized space. 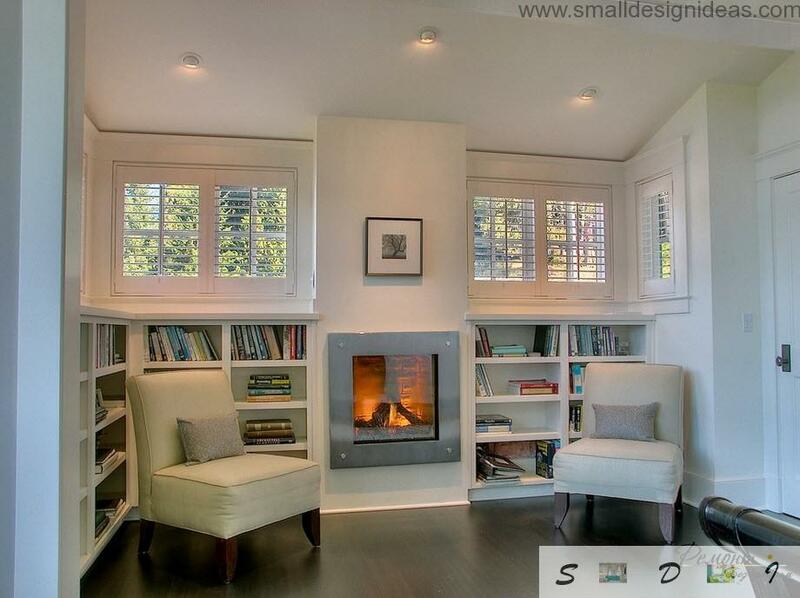 Dominating color in small spaces should be beige, sand and all shades of white. To break the monotony, you can resort to a bright acidic accents (in small doses) as accessories – cushions, rugs, curtains, covers of linen, cotton, silk or shiny/matte organza. Big print visually reduce the room, the small one will increase. To create depth, apply the technique consists in the illusion of distance. The brain peculiarly perceives the objects that are farther away. They look better (some details disappear or become blurred). Why not to use this illusion to enhance the prospect of living? It is enough to decorate a wall or furniture, which you want to “push” (make farther) in smooth and soft colors. Conversely: include texture into what you want to bring closer. In order to strengthen the perspective, do not leave nor one piece of furniture so that it prevented the common perception of space. For the brain, empty space, as a cloudless sky, is associated with expanse. Therefore, it is also important to enhance the visibility of going beyond the limits of the room. Leave free space in front of windows and open the curtains in order to eye would never met obstacles and led, almost unconsciously, into the outer environment. Peter Thompson, an expert on the psychology of perception, speaking in 2008 at York University (UK), argued that the difference in the perception of the object`s size can create horizontal and vertical beams that stylized by space and bodies. In 1860, this effect has already been discovered by the German physicist Hermann von Helmholtz, who conducted experiments with the perception of squares. He took 2 square of the same size, on each he drew parallel lines of the same width and dividing strips inside. The square with the horizontal lines had been perceived higher and stylish. As for the second square, it had been made the impression that the vertical lines occupy a large area. Therefore, if you want the wall to look taller, draw horizontal lines, if a broader, draw vertical lines. If you read somewhere converse statement, it is a delusion. This is proven by numerous experiments. Accessories and decorative items (lamps, pictures, mirror frames) with pronounced vertical and horizontal components are changing perception of the surrounding space. 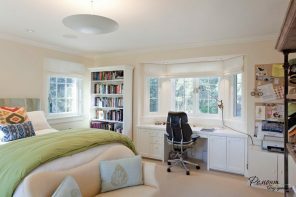 To begin the furnishings should be, of course, with the overall planning and an understanding that, if the size of the room is small, it should not be too much clutter – “extra” furniture will take space and reduce the feeling of volume. Each furniture “candidate” for the placement must have been carefully selected on the feasibility and necessity. Today’s furniture market offers a wide range of versatile and multi-functional pieces of furniture of small size and excellent design. Modern designers offer a variety of structures of furniture-transformers, which can be used in various ways. They are easy to clean and have as needed. For example, in a small room would be ideal to provide only two items – the only table that would serve as dining place and workplace, and sofa converted into a bed, quickly sliding and folding. Furniture is spread in order to provide more space. 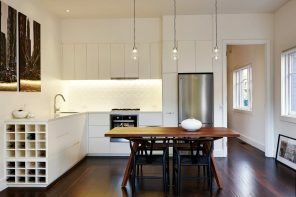 Several elegant folding chairs can be placed behind the closed facades of built-in cabinets and take them out as needed. 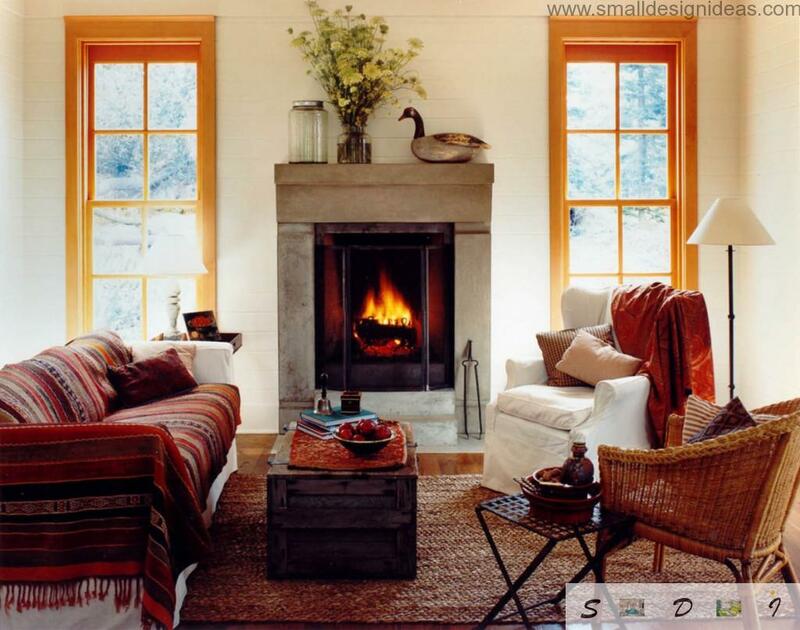 One can not imagine living without comfortable chairs set out in front of video system or next to the fireplace. To achieve a better order, experiment with pairs of furniture arranged on both sides of an imaginary axis of symmetry. A vertical line appears on the third longer than the horizontal size of the same length. What this illusion is based on? On the motion of the eye. According to the German psychologist Wilhelm Maximilian Wundt (argh, those Germans everywhere! :), laterally visual flow is more easy and fast, and vertically takes force and therefore is slower. Shelving located horizontally seems shorter (and “take” less space) than positioned vertically one. With plenty of light room is perceived as more vibrant and energetic, and at the same time more spacious. If you`ll play with contrast and shadow, you can increase the brightness without adding light. Light is perceived lighter and brighter, you just have to paint the surrounding areas. It showed professor optician Edward Adelson with his theory of the clarity contrast. The lesson is simple: a light source produces more light with the addition of a certain amount of shade. To apply this effect to the room, you can paint the wooden window elements in white and slopes in the dark. Thus, the light passing through the window frame would be enhanced and intensified by shadow. One of the simplest and at the same time magical tricks is to decorate a small room and make it visually larger and lighter – using mirrors in the interior. To a small room seem more spacious, you can put a mirror on the opposite wall. They reflect the natural and artificial light, visually increase the room. Mirrored walls are suitable for a huge number of styles and are part of the decor. Ideal for decorating bare walls. To perceive space organized and spacious, you can apply the illusion of a Kanissa triangle. Italian psychologist in the early twentieth century, discovered when using the imaginary room in the triangle (or square, rectangle) to put the furniture in each vertex of the angle, the brain unconsciously closes a geometric figure, and you will be able to separate the living area from the dining room, or educational corner without establishing real delimiters (which always reduces space). Some mishmash of wall decorations in the room can create an atmosphere of confusion. It should reconsider the collection and display the most favorite of them, instead of complete covering the walls and filling the shelves with works of art. The eyes can not focus on anything, and appears the impression of disorder and disorganization. The decoration of living less – it is really more. Finally, we reached the optimistic conclusion – the size is not the point. Create your own unique style with the help of tips from the best interior designers, and your living room will be transformed.